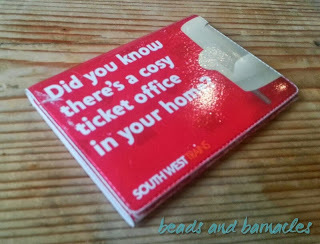 So I set about being a very nice sister and making her a brand new fabric card holder (with plastic see-through pockets) so she can store her railcard and other tickets without breaking everything. 1. Cut pieces of fabric for your outer and inner lining, these need to be large enough to hold the three cards, space to fold and enough extra to bind the fabric around the edges. I actually cut mine much larger than I needed, but the way I make it allows me to use the cards as a template later on and trim down the excess. 2. 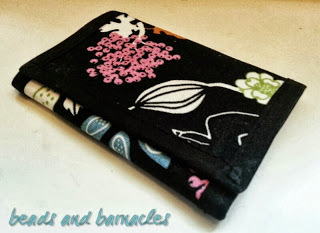 I am quite lazy for this, although you could just call it being practical, since I am binding the edges at the end I can simply sew the lining and backing together and cover the stitch line with the binding. 3. To make the plastic pocket covers I used a ‘plastic material’ it obviously won’t frey but I put hem along the end to strengthen it against stretching. 4. 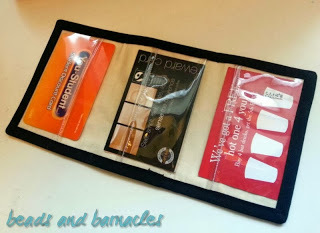 Cut the plastic into 3 pieces, each wide enough to cover the width of the backing fabric. 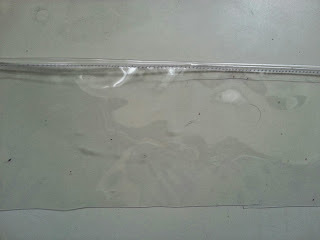 For the middle pocket secure the plastic right side to right side, so it can be stitched and folded back to form the pocket. Positioning it can be tricky so you can use a card as a guide. 5. 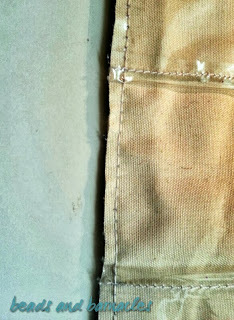 Once the middle pocket has been stitched, the end pockets can be stitched along the bottom of the pockets. As you can see, using the cards gives the real sizes of what will be stored in the pockets. 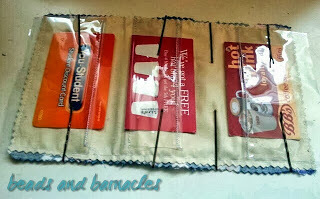 Make sure not to put the plastic completely over the cards or they will be more difficult to get out. 6. 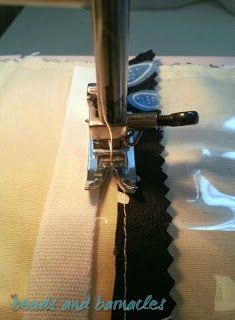 When sewing the plastic it can get stuck to the presser foot so I placed strips of of fabric on top of the plastic to make it move more smoothly. 7. Once the pockets have been secured across the bottom then make sure they are ‘pinned’ up the side and then sew up each side. I positioned the stitch line using the card as a guide along the edge of the presser foot. 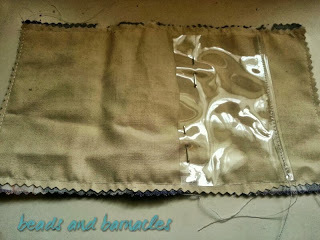 When the stitching has been completed then trim the excess fabric down to about 2mm. 8. Now time for the bias binding! I do use a quick method for attaching binding. It takes slighter longer to prepare it, but it makes it so much easier to sew it on. Fold the bias binding over the edge of the fabric, make sure that the binding has a little extra on the outer (patterned) side. 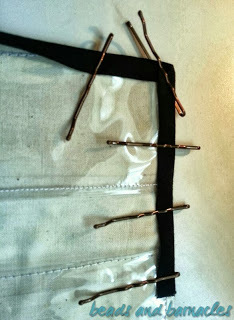 Then secure the binding with hairpins. 9. 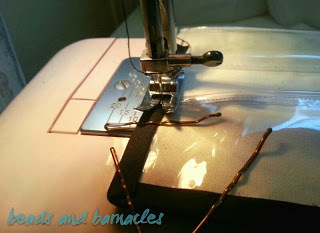 Now sew around the bias binding, don’t sew too close to the edge of the binding, leave a mm or 2. But be careful when pulling out the hairpins not to distort the binding. When finishing the binding you can pull the binding slightly wider to allow it to cover to start of the binding. 10. 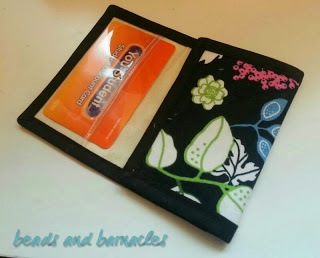 Now the card holder is finished! Hopefully it will last a lot longer than the plastic one! I might also put and elastic fastening band around it to hold it shut. You could sew it under the binding when attaching that, but I didn’t have any to hand, so I will just hand stitch it on later.